Hakka Bangka Mian (noodle) – Mie (Mian) Bangka Indonesia | Bangka Urang Kite Jitjong A.M.
Mian (Mie) Bangka 邦加麵 is very well known. You can find it in Jakarta, Medan, Palembang, Bandung, Semarang, Surabaya, Jogjakarta, Bali and other cities. What I meant by Mian (Mie) Bangka 邦加麵 is noodle made by Bangkanese or a noodle house belongs to a bangkanese. If you love noodle, you are kindly invited to visit Bangka and try Mian 麵 Asu and Mian 麵 Ciong-ciong. 90% of chinese population in Bangka Island 邦加岛, Indonesia 印度尼西亚 is Hakka People 客家人, Hak Ngin. So that the Mian (Noodle) 麵 is typical Hakka Mian (Noodle) 客家麵. In the past, the famous “mian” (noodle) in gang singapore, pangkal pinang (pinkong) named Ciong-Ciong. Ciong-ciong is the founder’s name. He uses special ingredient and has good taste. Ciong’s noodle can be classified as Hakka Mian (Hakka Noodle) 客家麵. Usually called Yam Mian. Ciong’s Mian (Mie) 麵 is thin, crunchy and oily. Topping with soy-sauced minced pork. smell is good and very tempted. You can add with a bowl of Thew Fu Kok combined with Kiauw Se (Pangsit), Fu Kian and Eng Jan. All of these are made of fish. 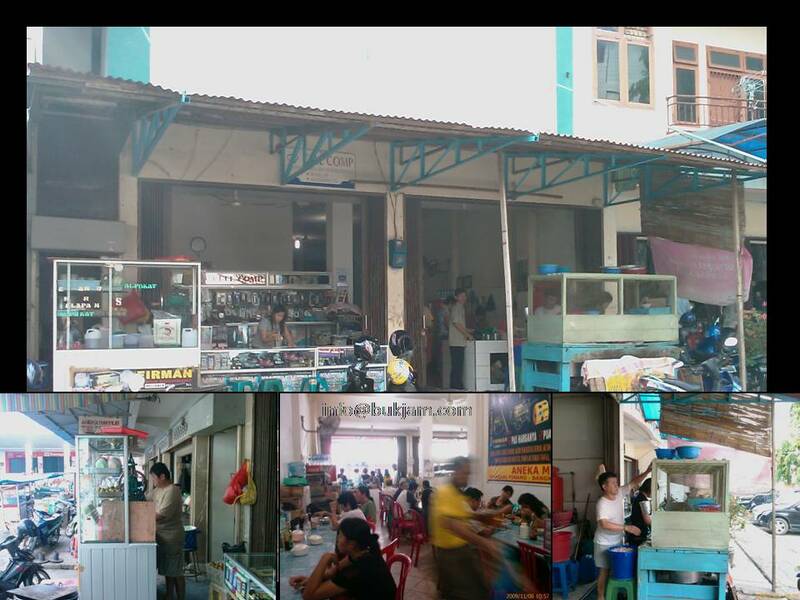 Although not crowded as before, Ciong-ciong’s mian 麵 still exist under his 2nd and 3rd generation in several places in Bangka including on its first place in gang singapore. Just 8 minutes walk from the gang singapore entrance. Click Here to see the picture ! Todays, the most famous mian 麵 (noodle) in pangkal pinang (pinkong) called Mian 麵 Asu, meaning Asu’s Mian 麵. Asu is the owner’s name. He is son of Lo Ong, the founder. Mian 麵 Asu is the biggest “ Mian Than “ ( noodle house ) in pangkal pinang 槟 港. He sells not only Mian (Mie) 麵, but also Mifun (bihun), panthiauw (kwetiauw), lempah cukut, songsui, etc. Asu’s Mian (Mie) is brownish, because of soy sauce, and oily. Topping with brownish minced pork. You can add with a bowl of Thew Fu Kok combined with Kiauw Se (Pangsit), Fu Kian and Eng Jan. It is easy to find. It is in front of Ramayana department store. In pangkal pinang (pinkong) 槟 港, almost everybody have an experience of Mian 麵 Asu. Just 8 minutes walk from Budi Mulia school. 8 minutes walk from catholic catedral church. See the below picture! Both of them have their own flavour. You can eat on site or take home. It cost around Rp8,000/bowl. They are easy to find, just ask anybody in pangkal pinang (pinkong) 槟 港. Try and Enjoy the Mian (Mie) 麵!Have fun in Bangka Belitung 邦加 勿里洞. AN HO SIT..oo..